This is derived from the academic talk delivered by Purdue University’s Professor Karthik Kannan, earlier this year, at the two-day ISB Digital Summit which draws together industry experts, business leaders, marketers and academia to discuss the latest innovation and marketing models. a To provide a big picture on digitisation trends, and also highlight how some of these aspects will play out in this shadow economy or platform-based economy. b Connect the big picture to see how we rethink value addition. Or is it something that we can just simply abstract away, and use a developed country model for implementation in the developing countries? c Thirdly, what are the current market trends that will provide some highlights about the models in play? All this while we thought digitisation was about converting manual, paper-based processes into digital processes. These translated into implementations like electronic health records implementations among many things. The two main objectives, therefore, were to achieve quicker information flows and be less error prone. While these digitisation efforts were going on, there were one or two projects that were turning out to be spectacular. What was interesting about these projects was that they changed the sequence in which information flowed. By doing this they generated value. And lo and behold, this value addition led to newer models and newer companies getting started. 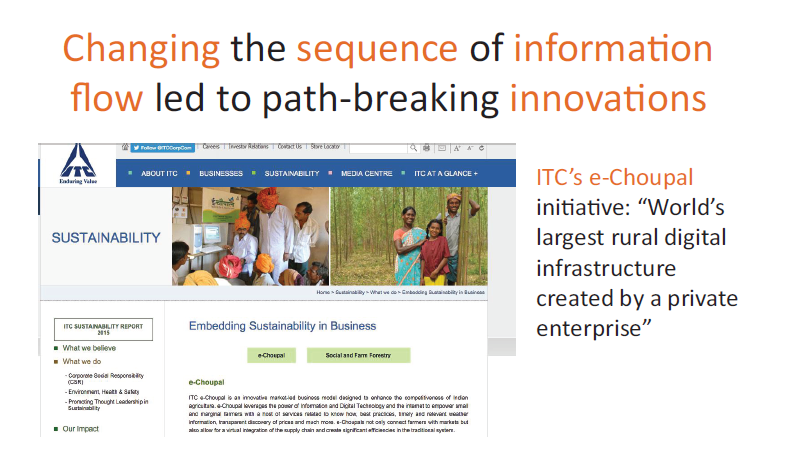 ITC e-choupal was one of the very prominent ones to do this. It is a case study that Harvard Business School has published, and is being widely taught in many business schools including at ISB. The story is very simple. What you see is that in the early days farmers would go to the mandi, display their products and allow customers to inspect them. They would auction the product for a specific price and eventually the payments were realised. On the contrary e-choupal came up with a new process. If you paid attention to this new process the only big thing which changed is the price discovery. Pretty much everything else remained the same. What is interesting is that this price discovery was happening at different stages of the buying cycle – in some cases later, in some early. Basically what happens is that when the price discovery happens later in the cycle, the farmers face uncertainty. Once the information flow moves further up in the value chain, lo and behold, the farmers are better off. Not only that, ITC is also better off because of the innovation resulting in better prices and products for both. This is one example where information can be exchanged and you are generating value because of this information exchange. This is not just restricted to what I call as traditional forms of business. It’s actually happening in the newer forms of businesses as well. This is where I want you, as entrepreneurs and as digital summit participants, to be thinking. What we would like for you to see is scenarios where we can change the information flow and thereby generate value. Here is a simple example and this is in the new ventures market. Typically how do we develop and how do we go to the new markets? We start; we go and ask money from the VCs. We develop the product and then we reach the market, and see if the sales happen. Anecdotal studies have suggested that the venture capital success rate in this sort of a process is about 20-30%. A large portion of them are being turned away. Why? A big part of it is because at the sales stage you are facing market uncertainty that is likely to come in later. Just like how we saw in the case of ITC, can we move that process? Can we sell the products before we even develop them? And can we develop the product before we can even go to the venture capitalist? The answer is a resounding yes. Communities like Kickstarter have shown how process can be moved. For those of you who may not be familiar with it Kickstarter is a website where people like you and me can be innovators and we can put up our ideas. Crowds; people like you and me again, can participate on this website and support projects. Here is one example, where it is called Revolight. It is a light that attaches to the rim of your bicycle. The innovators wanted $40,000. They raised $215,000. Oculus Rift is another device again which got kick-started and eventually Facebook bought it. There are many such success stories as well but the main focus is when I ask my students where the value addition is coming for Kickstarter? The common answer is that it is a platform which brings crowd funds to new products. Yes, but the answer is only partially correct. 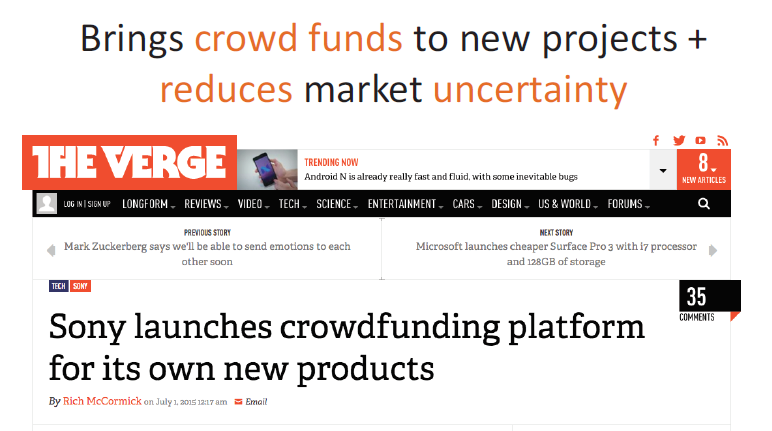 In fact, what helps Kickstarter, or rather what’s new about Kickstarter, is that it reduces market uncertainty. To further validate this I am going to show you a screenshot from a news page. Sony has created its own crowd funding platform for new products. Why would Sony do this? Doesn’t it have money to raise and develop these products? It’s because of the second component highlighted on the heading there, it’s about overcoming market uncertainties. The more we think about these, can we think about what I call recombinant information tools. If your firm is in the business of aggregating just supply and demand, information technologies are going to come in and replace it. There are two possible ways in which this can happen. One is that market disintermediation completely goes away. The other possibility is the emergence of what we call the network effects based systems. We are able to re-sequence information and thereby generate value. I am motivated to refer to this as recombinant information flow partly because of recombinant DNA technology in which you combine sequences of DNA to create new forms of DNA. Here we are combining new forms of information flow to create something new. What we have seen? As in the US we say, you ain’t seen nothing yet. So clearly, we are at the cusp of a series of innovations that can potentially be coming up because of us changing this information flow. Theater comedy club in Barcelona Teatreneu is another such example of this. What is interesting about this club is how they use technology. In a typical comedy club you enter it by paying a flat fee. But Teatreneu has two options for your payment. One is a fixed flat fee. Alternatively, you can choose to pay per laugh. They use facial recognition software that tracks how many times you laughed and every time you laugh you end up paying money. This is fun because this is spectacular in a way because it is allowing us to create new forms of innovation that are taking advantage of these technologies. The Internet of Things (IoT), or the Industrial internet, is going to drive the value chain in a manner that we have not seen before. Again as an academician I am going to abstract all the details to focus a little on the big picture of what’s going on. Typically, the buyer pays for the product and then goes inside the house, locks the door and enjoys the product. This is how companies’ B2B sales happen pretty much. The key aspect here is that the seller does not have information about how an individual buyer values the product. Now what have we done? With IoT it is now possible to swap this chain. When does a buyer pay? He pays after he realises the value. He doesn’t pay before he has experienced the product as in the old model. He pays afterwards. To my academic colleagues this would correspond to what we call as third degree price discrimination or something close to it. Third degree price discrimination is very crucial as we move into this new age technology. For the comedy club the moot question is how is it going to affect business? The market is getting changed into when and where we are leading with platforms. These platforms are exhibiting what we call as network effects. For large companies this is transformational. For instance GE, which is big into the industrial internet, is calling itself the digital company. It is not into manufacturing anymore or at least that’s how it is projecting itself. In GE’s traditional business model it would sell a wind turbine to E.ON which will buy the turbine, and whatever electricity it generates it retains its power. But in the new IoT dispensation, the equation has transformed. Just like how you have started paying for laughs, E.ON is paying only for the electricity being generated by the wind turbine. So GE measures the electricity produced, provides the maintenance support and shares a portion of the profits generated by E.ON by selling the power. Again and again, we are seeing these information flows changing, and with technology in place this change is becoming easier. Now what has this got to do with the platform economy or what has it got to do with platforms in general? What it is doing is it is affecting platforms as we know them. It has not only transformed some of the platforms, but also some of the domains themselves. The music industry is one such sector that we can relate much easily. First, we had music production companies that made CDs which were sent to physical music stores. Consumers came in and purchased these products. As digitisation increased these information flows became much sharper, faster, and the value that these intermediaries were providing was becoming practically useless. Subsequently we saw these companies die out. The main take away from this is that if your firm is in the business of aggregating just supply and demand, information technologies are going to come in and replace it. There are two possible ways in which this can happen. One is that market disintermediation completely goes away. The other possibility is the emergence of what we call the network effects based systems. Let’s think about this in the context of Uber which I am going to use as an example. The model on which a typical cab company works is that it has drivers to whom customers don’t easily get access to. That is the information friction that is in the market. As the technology develops this friction is going to disappear. I have on the one side many cab drivers; I have on the other side many consumers. The market is getting changed into when and where we are leading with platforms. These platforms are exhibiting what we call as network effects. The more the number of consumers there are, the more number of cab drivers that are going to join. The more number of cab drivers there are, the more consumers are going to join. If you go and ask VCs why they are investing in Flipkart, Amazon and others, or for that matter Uber and Ola, they will tell you their hope is that one of these companies will stick around and be successful. VCs tell me they are interested in investing in companies that exhibit network effects. Why? These network effect based companies typically tend to be monopolistic in nature which is very, very good for us. So long as they can manage the ecosystem it’s very good and they are going to be invested. However, when VCs say this, there are a few caveats associated. While the network based phenomenon is quite widespread, I want you to remember that two-sided network platforms are the key. For example, Airbnb is a two-sided network effect platform. On the one side you have people who are putting up their houses for rent, on the other side you have people who want to rent. Xbox is an example of a two-sided network. You are going to choose Xbox if there are lots of game developers. The game developers are going to choose to develop games on Xbox if there are lots of consumers. So these kinds of two-sided network effects are quite common. EBay is another example. As we know it is a C2C platform. You may see variants of this in different countries also. Again, in two-sided networks you have buyers and sellers. The more buyers come in, the more the sellers. The more the sellers come in, the more buyers there are. These are again what we call as two-sided networks. What is also important here is that when you take these network effects, platforms or business models and move them across countries, you need to be very, very clear about where the value chain is or understand what that value of that recombinant information is. So let’s take eBay as an example again. One of the key things about eBay is the trust factor based on which transactions take place between the buyer and seller. So the element that eBay brings to the table is those star ratings of the sellers making sure those transactions go through properly between the buyer and the seller when they are exchanging goods. In response to this what does eBay do? It charges the seller a commission. This is how they make money. Now eBay tried to take this exact model and tried to implement it in China. However, what transpires is that instead of buying and selling on the platform, buyers and sellers use it to identify information about each other and then they transact outside the platform. If that is the case how will eBay make money? Enter Taobao, another C2C company. It is also about network effects. The more number of buyers there are, the more the number of sellers there are, and more number of sellers there are more number of buyers there are. So what is the value-addition that Taobao offers? Taobao surprisingly recognised that it is about the access. It is about making sure that it’s the gatekeeper of access. So it started charging not for the transaction the way eBay did, but for the access that the sellers get to reach these consumers. So on their website the consumer goes and searches for a particular product. They have organic search results that come up to which you have an add option, just like on eBay. But the difference is you are paying for information and not the transaction. How big is the success? This company is now having 90% of the market share according to industry statistics. That is spectacular when you think about it. The message that I want you to take away is that, yes, these value chains and recombinant information flows are great, and we should be thinking about them to create platform-based models. But one should not blindly follow these models. Understand where the value provision is and then adopt the business model based on this understanding. The other aspect that I was observing again is which company is going to be the next Uber? And are there any insights to be gathered from these network based companies? Netflix is one example that is just plain simple. The higher the number of producers that make their content available on the platform, the more the consumers who will get onto Netflix and vice versa. The problem is that movie producers are not just restricted to Netflix. They can go to any other platforms like Hulu and make the exact same content available. Similarly with Uber car drivers technically, theoretically speaking can be subscribed to Ola as well. We call this multi-homing. The moment multi-homing comes in, the profits of platform companies get squished. How do they respond? It is not something that platform companies can afford to wait and watch till it happens in volume. They have to respond effectively and quickly as well. Netflix is yet again a good example of this. House of Cards is the content that Netflix created by itself and arguably saved itself from getting squished up. Let’s think about this in context of Uber. Uber is also in this space. You have Ola and others. The way I see it, Uber has done something pretty cool in terms of coming up with driverless cars. They have hired away a few computer science faculty and started this driverless car initiative. It is a market where potentially they can get squished because of competition and the question is if they can add any value proposition that will protect them in the future. That’s the way we see it. A First watch out for newer kinds of recombinant information flows. Think about other domains where you can generate new pieces of information or take existing information where the results are ready biases. Can we overcome them by moving them into a different channel? B Secondly, when you think about network based platforms, which are also a consequence of these recombinant information flows, be careful about just bringing ideas from US and implementing them. Understand what your value proposition is. C Lastly, when multihoming starts to kick in and network based platforms face the threat of being squished, they need to start generating their own market place and own value addition. Karthik Kannan is Professor of Management at the Krannert School of Management, Purdue University and Visiting Professor at the Indian School of Business (ISB).